(EMU) – St. Kitts, March 27, 2019: The Cotton Thomas Comprehensive School is the recipient of a 50” Sharp Aquos Smart TV, donated by the proprietors of City Dental on Tuesday 26th March. the community, Drs. Trevor Christmas and Randy Liburd of City Dental highlighted the fact that investing in the community is a great way to re-invest in those who have helped support their business. During brief remarks at the office of Deputy Prime Minister and Minister of Education Hon. Shawn Richards, Dr. Christmas announced that working with students with special needs has always brought a pleasant feeling of connectedness and satisfaction that led to the donation. 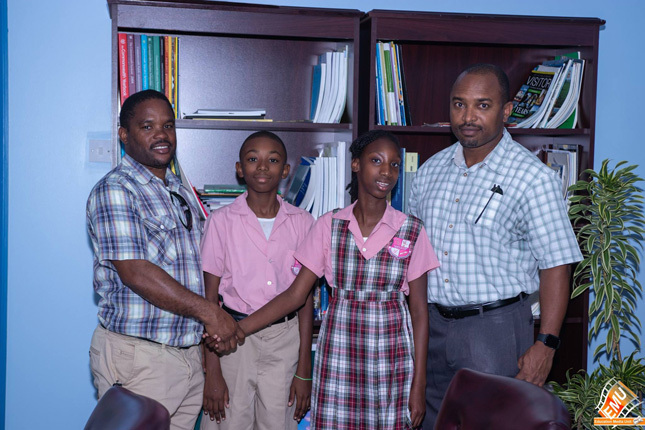 Present at the ceremony to receive the donation were, Principal of Cotton Thomas Comprehensive, Charmaine Blanchette accompanied by two students and one staff member, Permanent Secretary in the Ministry of Education, William Hodge.